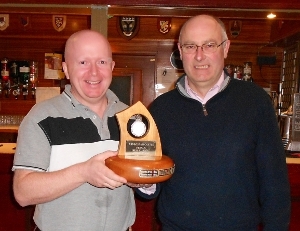 Ardrossan Castle winning skip Andrew Campbell receives the trophy from ICA President Bill Gray. 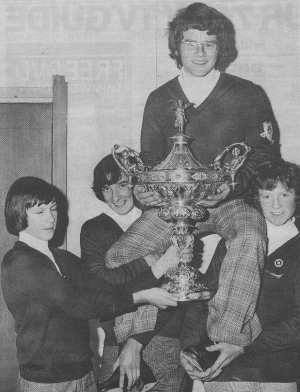 This friendly annual event was revived by the ICA in 1994 but was first played in 1861. Originally we hoped to play it alternating between Irish and Scottish ice rinks, however we cannot provide ice time in Ireland at the moment. 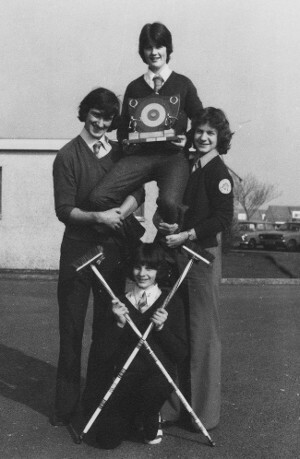 The Trophy is the Belfast Medal hanging in a wooden curling stone. The medal was originally played for between Belfast Union and RCCC. 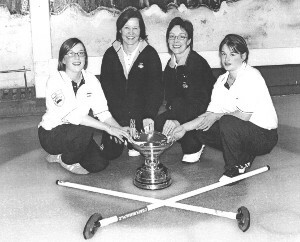 The venue this year was be Harvies Rink in Ardrossan, Scotland, followed by sandwiches at the Rugby Club. The competition is two teams from each club play a single 8 end game each and the aggregate score across the two rinks determines the winner. 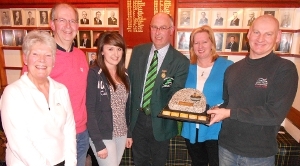 This year the trophy was gained by Ardrossan with an aggregate score of 22 stones to 10. The ICA seldom play at this ice rink and found the ice challenging but the company warm and friendly. The profiles of the Irish men’s team going to the Euros in Sweden in December turned out to be informative and revealing! With the World Seniors in Canada now on the horizon, let’s do the same with these players and see what answers raise the collective eyebrows this time! 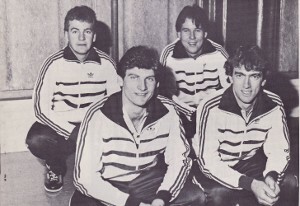 at Northwest Castle Hotel, Stranraer, Scotland. 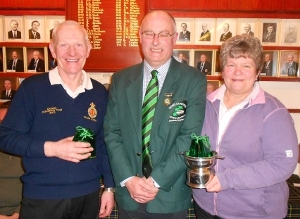 This was the 16th annual bonspeil and as usual the North West Castle Hotel were excellent hosts for the event. 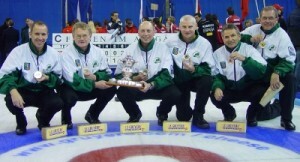 All teams enjoyed 4 games of curling which was scored using the schenkel system and split into high and low roads on the Sunday. 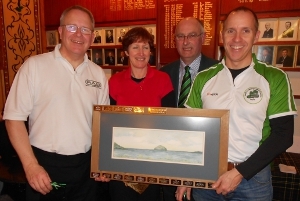 High Road Runners Up with The Ailsa Craig Painting – Alastair Fyfe, Kate Adams & Neil Fyfe (skip) & lead Alison Fyfe (absent) presented by ICA President Bill Gray. 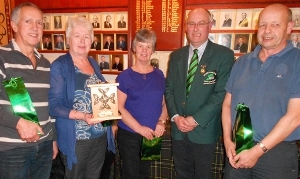 Michael Sutherland, Fiona Turnbull, Frank Forest, Roberta-Ann Forest presented by ICA president Bill Gray. 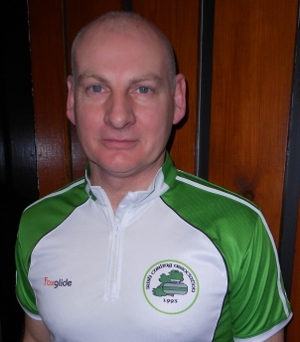 The dates for the Irish mixed challenge for the right to represent Ireland at the European Mixed Curling Championships 2013 have been announced. 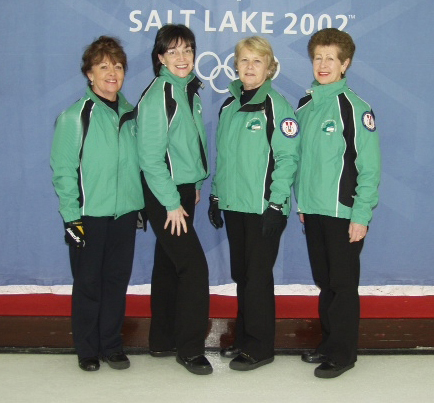 Robin Gray‘s rink of Louise Kerr, Johnjo Kenny and Hazel Gormley-Leahy and PJ Wilson‘s rink of Alison Fyfe, Neil Fyfe and Helen Wilson will playoff in a best-of-three at Greenacres Ice Rink. Game 1 – Friday, 29th March – 7.30pm. Game 2 – Saturday, 30th March – 8.30am. Game 3 – Saturday, 30th March – 12noon. The venue for the European Mixed has not yet been announced officially but, Murrayfield in mid-September seem to be the worst kept secret in curling. 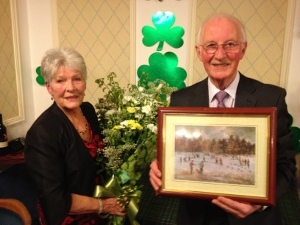 Held at the Green Hotel Ice Rink, Kinross in Scotland on Sunday 10th February 2013. For this bonspiel, attending members were divided up into six rinks who are drawn to play against one other rink. 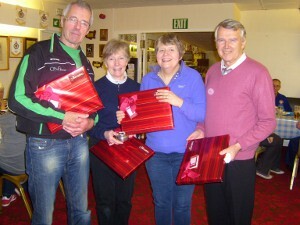 The bonspiel winners were David Smith (skip), Mary Radcliffe, Sue Scotland and David Hull. Thanks to our Kinross friends for making up the numbers, and also a warm welcome to our potential new members and our guests.